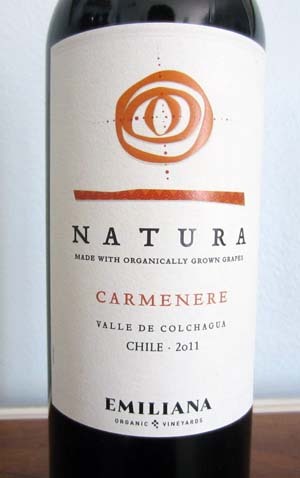 This 2011 Natura Carmenere is a wonderful example of a true organically grown wine, allowing the true flavors of the grapes to shine through. The Natura vineyard, located in Colchagua Valley, Chile, is comprised of winemakers who understand that the best way to obtain healthier vineyards & wines, help protect the environment, as well as its workers, is to farm with organic and biodynamic agriculture. In other words, replacing the pesticides, herbicides, and fertilizers with natural products such as compost from the actual grape plants themselves, fertilization by planting grasses and legumes around the plants that help contribute nitrogen to the soil and allowing animals to graze to help control the weeds. This also serves to protect the soil from contamination and degradation and reduce the vineyards overall carbon emissions. 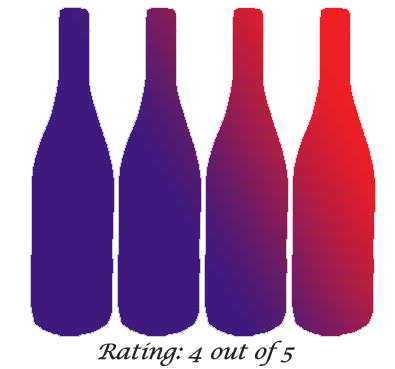 Their ruby red Carmenere is composed of 85% Carmenere, 8% Syrah, 4% Cabernet Franc and 3% Merlot grapes and has repeatedly won awards through the years sponsored by such notables as Wine Enthusiast, Wine Spectator and Wine Advocate. The wine has earthy aromas of dark cherry & blueberry and a touch of black pepper and is velvety smooth. 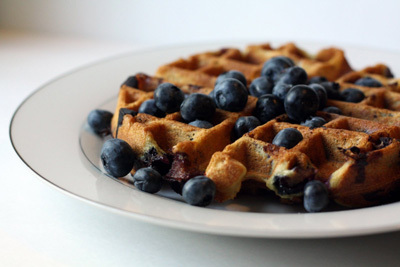 On the palate, there are prominent tastes of blueberry and boysenberry as well as hints of sassafras, black tea, vanilla, mocha and chocolate. The finish is fruity but not overly complex with a touch of mint and chocolate. A medium-bodied, dry red wine that has light spices and a smooth texture and makes a perfect everyday drinking wine. A steal at $8.99! 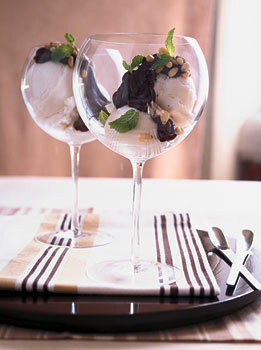 Serve chilled between 60-65 degrees. Food Pairing: Serve this wine with grilled red meats as well as poultry, ham, pastas and ripe cheeses. When I first saw this wine on Total Wines’ Top 15 Summer Wines under $15 and listed at #5, I wondered what type of red wine it actually was. It turns out that it is a combination of 5 different grapes, 60% Red Grenache, 35% Carignan, 2% Merlot, 2% Syrah and 1% Ull de Llebre, some of which I had never heard of, but thought with such a high recommendation I would give it a try. This wine is from Spain and made from grapes grown at the foot of the Montsant in the Siurana Valley. Most of the vines at the vineyard actually date back more than 80 years. This blend has a high percentage of the Grenache grape, which is the grape primarily used in Riojas and light Rosé wines, but with the addition of the Carignan and Syrah is much more full-bodied than its counterparts. Upon opening, aromas of black cherry, plum, Asian spices, smoke and licorice drifted to my nose while the first sip brought flavors of plum, dark cherry, a hint of mocha and some complex minerality to my palate. It is definitely a full-bodied Spanish red but with a little too much of a sour taste for my liking. I did find that after letting it breath for an hour it was a little less sour but I would probably not purchase this wine again as I feel there are better full-bodied red wines available for a more reasonable price. 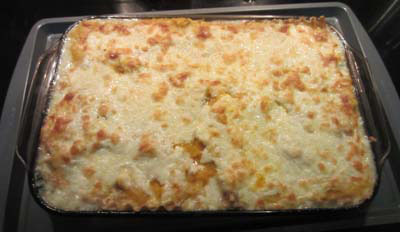 Food Pairing: Serve with red meat, heavier fish, pizza, pasta, tapas selections and hard cheeses. OK, that is one strange title but I thought it would be fun to tie in my wine posting with National Hot Dog Day (and incidentally National Hot Dog Month) and see where it took me. There are three perfect choices for those lovely grilled dogs, plain or with just a little mustard and sauerkraut on top, and they are Rose, Pinot Grigio and Pinot Noir. All are full of fruitiness and crispness that compliment the sausage itself as well as the sour character of the sauerkraut. So this week I bring a delicious and inexpensive Pinot Noir to your attention that goes perfectly with your outdoor barbecue. And a little extra info for those that like their favorite dogs in other than the classic style. Chicago-style dogs – stick with a light to medium-bodied crisp white wine that matches the saltiness of the pickles and peppers and choose a Riesling or Sauvignon Blanc. 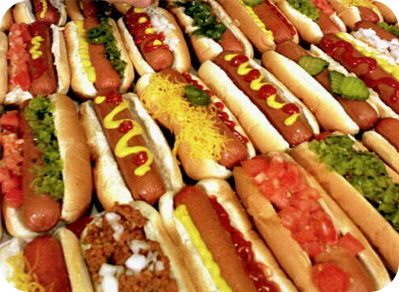 Chili dogs – opt for a full-bodied Zinfandel or Shiraz that helps cool down the spiciness and cut through the fat. A wonderfully crisp medium-bodied wine with musky floral aromas and smooth berry flavors of cherry, strawberry and blueberry. 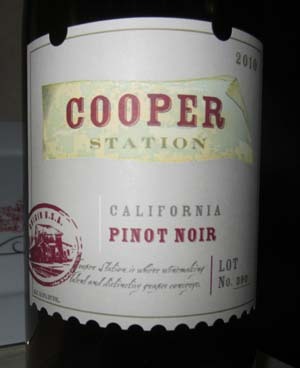 Notes of spice, cloves and herbs give this Pinot Noir a nice complexity and the hint of toasty oak adds just the right touch. It is a great wine for your backyard barbecue that can hold its own against many of the pricier brands. 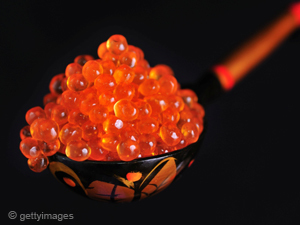 Fish is a healthy and delicious way to give your body the protein it needs without all the fat. Fish is filled with omega-3 fatty acids that keep our heart and brain healthy as well as important vitamins such as D and B2. It is also a great source of calcium, phosphorus and minerals, such as iron, zinc, iodine, magnesium, and potassium. All that in a little piece of fish! This meatless Monday is a great time to start eating one of your two recommended servings of fish a week to help you on your way to a healthy diet. Preheat grill. Prepare a grill pan by spraying with nonstick spray. I like to purchase the fillets that still have the skin on one side. This helps hold this delicate fish together on the grill. Sprinkle fish with a light coating of cajun seasoning and place flesh side down on hot grill. Cook 4 minutes on flesh side, turn, and cook 4-6 minutes, skin-side down, or until fish flakes easily with fork. While fish is cooking, combine butter, oil and remaining ingredients in a small saucepan. Cook over medium heat until butter has melted then turn heat to low and keep warm until fish is done. 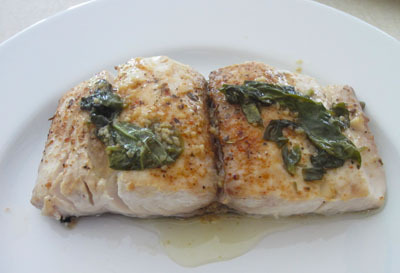 To serve, place fish on platter and top with some of the basil butter. Garnish with slices of lemon and a sprig of basil. 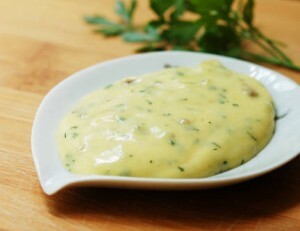 Tip: Serve with steamed broccoli as the basil butter makes a delicious topping for this as well. Wine Pairing: Choose a light white wine for this delicate, flaky fish so as not to overwhelm the dish itself such as a Sauvignon Blanc, Chenin blanc or Pinot Grigio. You might also try an unoaked Chardonnay as these are much lighter than their oaked counterparts. 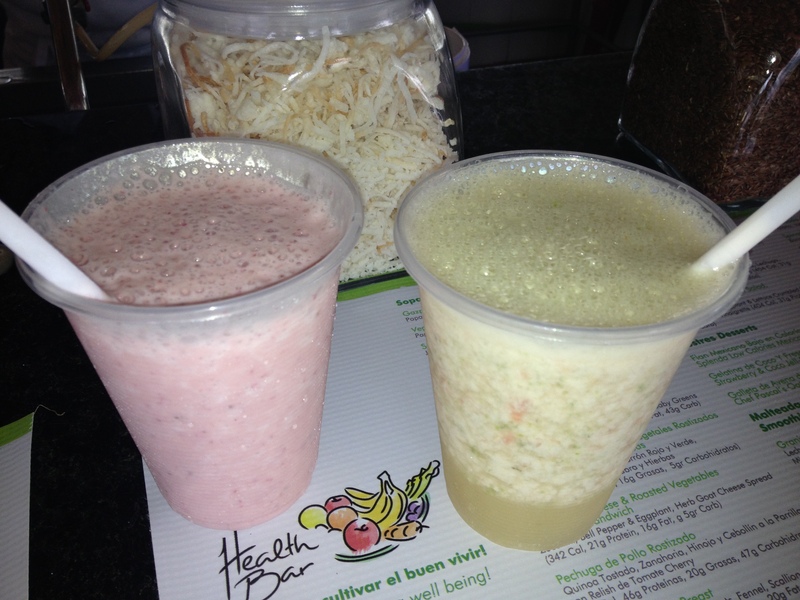 We just returned from the El Dorado Royale Resort in Tulum, Mexico where one of their featured lunch restaurants, Health Bar, had an out-of-this-world smoothie bar. 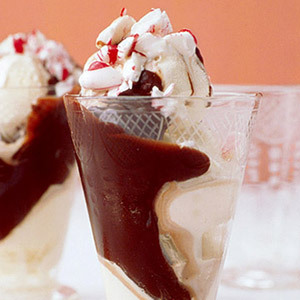 Here are two of my favorites that I will be trying to recreate at home. Now, where can I find some cactus?